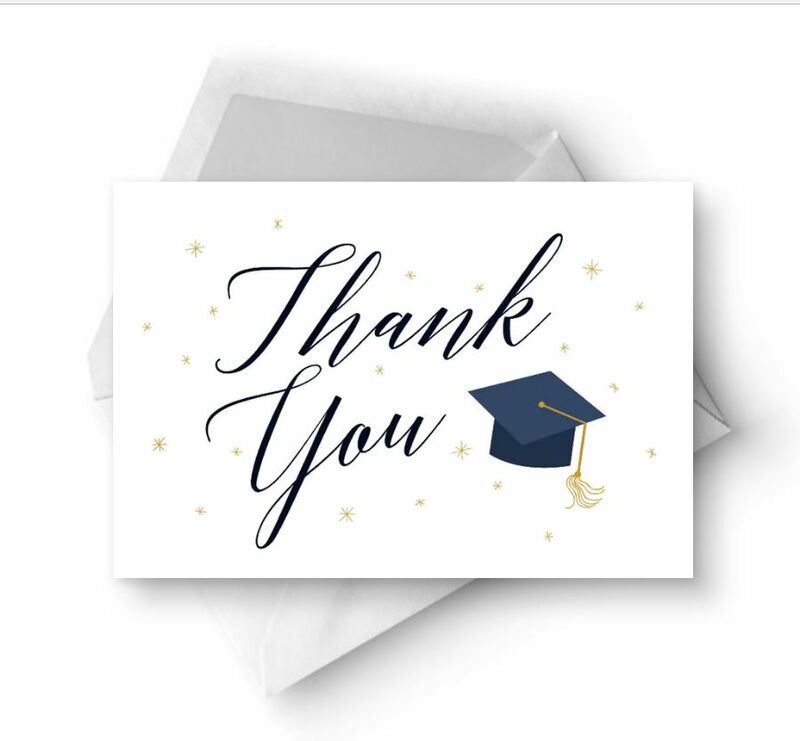 Sending out a graduation thank you card to anyone who gave you a gift or attended your ceremony or party is a must-do. It's important to get your graduation thank you cards in the mail as soon after the ceremony or celebration as you can. Within the week is expected but sooner is even better. These graduation thank you cards are all free and they can all be customized with text and photos before or after you print them. It's the final step of graduation and makes sure that your friends and family feel appreciated and loved. If you want to create your own graduation invitations, here are some ​free graduation templates that look just as good as ones you buy at the store or through the school. This graduation clipart might be a fun addition too. If you're looking for a more casual card or just something a little different, here are some free thank you cards that you can print out and mail to the people you want to thanks. There are also free graduation congratulations cards that you can give to your friends who are graduation along with you. Say thank you. Say thank you for the gift, thank you for attending, thank you for their support, thank you for cleaning up after the party, and so on. Anything that they did for you or gave you, you need to say thank you for. Be specific about the gift. If you are thanking someone for a graduation gift, mention what they got you specifically and then tell them how you plan to use it. Add something personal. This is the place to express how much they mean to you, how glad you were to see them, how sorry you were that they couldn't make the party but still send a gift or anything else that makes the thank you card feel less generic. Re-read the thank you card as if you were receiving it. If it sounds personal and sincere then you're all ready to get it in the mail. Here are some free envelope templates and address label templates if you need them for your cards. Here's a free, printable graduation card thank you card that features the phrase "Thank You" with gold stars and a graduation hat. It's a simple card that's great for any age of grad. The black background of this graduation thank you card really makes the gold "thank you!" and white and gold dots pop. You can customize the text of the card with the class year and name of the graduate. It downloads as a PDF file that you can print or save. This free graduation thank you card lets you add your own photo of the graduate. To the right of the photo is a place for the class year and graduate's name. It's available in four colors, gray, light blue, black, and plum. All text can be customized and if you can print it out or send it as an e-card. Here's another graduation card that lets you add a photo before printing. The left side is designed in deep blue and green and leaves room for a message. This card would make a great postcard to send out to everyone to say thanks for their support. There are actually four printable graduation thank you cards here, each with a different style and design. These cards can't be customized before printing, but you can add a handwritten message on the back of the card before sending it to the recipient. 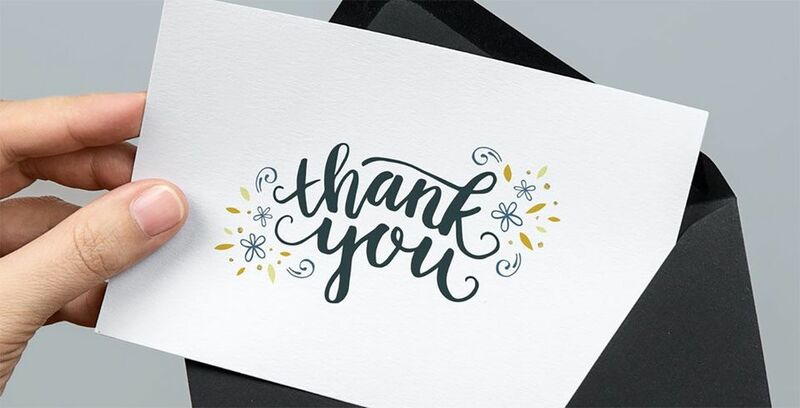 Here's a free, printable thank you card that can be used for any occasion but with the design lends itself perfectly for saying thanks for a graduation gift. Download the card with a single click and print as a 7"x5" or 6"x4" size. Cut lines and score lines make it easy for it to look great. Here's an easy DIY project that anyone can tackle, and you'll love the outcome. Simply add a photo to one of these three thank you designs and then write your note before sending them off. There are complete instructions for making these where the photo you include can easily be taken off the card and saved for a keepsake.